Oil - Sit down for this! Oil - You'd better sit down for this! Read this Snopes on Bakken, after you've finished reading this article. About 6 months ago, the writer was watching a news program on oil and one of the Forbes Bros. was the guest. The host said to Forbes, "I am going to ask you a direct question and I would like a direct answer; how much oil does the U.S. have in the ground?" Forbes did not miss a beat, he said, "more than all the Middle East put together." The Bakken is the largest domestic oil discovery since Alaska 's Prudhoe Bay, and has the potential to eliminate all American dependence on foreign oil. The Energy Information Administration (EIA) estimates it at 503 billion barrels. Even if just 10% of the oil is recoverable... at $107 a barrel, we're looking at a resource base worth more than $5.3 trillion. "This sizable find is now the highest-producing onshore oil field found in the past 56 years," reports The Pittsburgh Post Gazette. 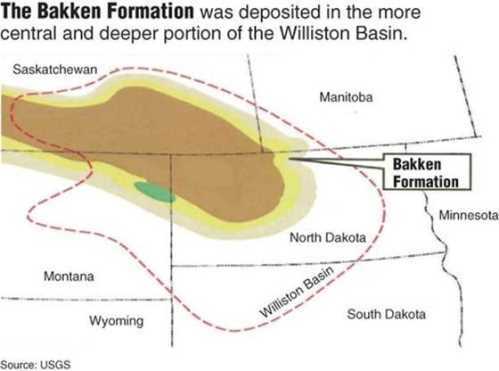 It's a formation known as the Williston Basin , but is more commonly referred to as the 'Bakken.' It stretches from Northern Montana, through North Dakota and into Canada .. For years, U. S. oil exploration has been considered a dead end. Even the 'Big Oil' companies gave up searching for major oil wells decades ago. However, a recent technological breakthrough has opened up the Bakken's massive reserves.... and we now have access of up to 500 billion barrels. And because this is light, sweet oil, those billions of barrels will cost Americans just $16 PER BARREL! Pass this along. If you don't take the time to click on the Share This link below, then you should stifle yourself the next time you complain about gas prices - by doing NOTHING, you forfeit your right to complain. Now I just wonder what would happen in this country if every one of you clicked on 'Share This' and sent this to every one in your address book. By the way...this is all true. Check it out at this link http://www.usgs.gov/newsroom/article.asp?ID=1911!! GOOGLE it, or follow the above link. It will blow your mind.